The first Tiny Buddha quote appeared on Twitter in 2008. Since then, the archives have grown to include over 1000 wisdom quotes, with new quotes added every weekday. You can now embed a daily wisdom quote right on your site with the Tiny Buddha Quote Widget for WordPress. This plugin will display the quote of the day from Monday through Friday. On Saturday and Sunday, the plugin will deliver a random quote from the Tiny Buddha archives. 12/21/11 UPDATE: The quote widget has been changed so that it now delivers a random quote from the Tiny Buddha archives each day. 1. 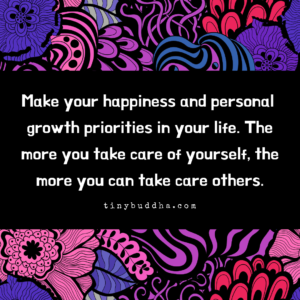 Upload the file ‘tiny-buddha-quotes.zip’ via Plugins > Add New > Upload’ OR Upload the ‘tiny-buddha-quotes’ folder to the ‘/wp-content/plugins/’ directory via FTP. 3. Enable the widget via Appearance > Widgets in your dashboard. 1. How Often Do Quotes Update? You will receive a random quote from the archives every day. 2. Does it require WordPress version 3.0 and above? Currently, I don’t have a support team in place for the Tiny Buddha Quote Widget. If you have any questions or feedback, it would be best to post it here so that other readers can see my responses. If you have any suggestions to improve the Tiny Buddha Quote Widget in future versions, please let me know!